Step 3. Click the "Merge Documents" button under the Home tab in the PDF Converter toolbar. Step 4. Select the 2 (or more) PDF documents that you wish to merge. Step 5. Click Merge, and choose where to save the new merged file to on your computer. Quickly merge 2 or more PDF documents, without even having to open your files. 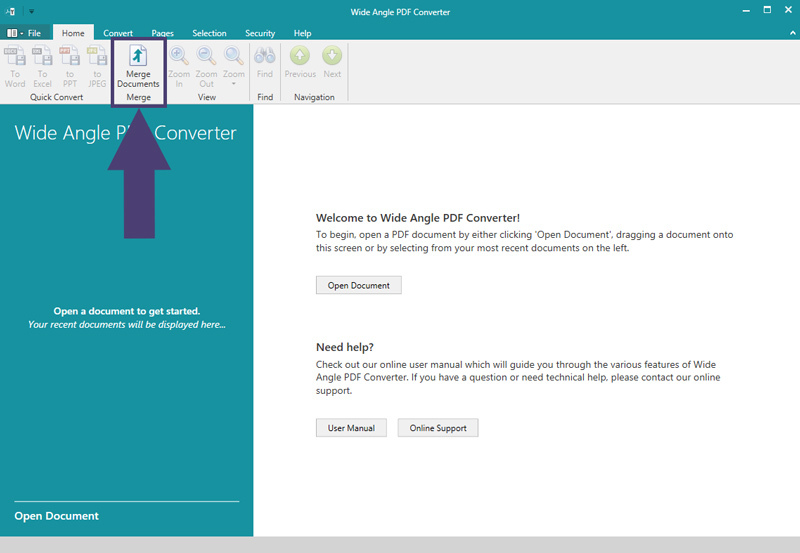 When you open PDF Converter, before opening a file, click the "Merge Documents" button in the Home tab. Once all PDFs have been added, and you're happy with the order, please click "Merge" to join PDFs. Finally, select where you'd like to save the merged file to on your computer, and hit Save. 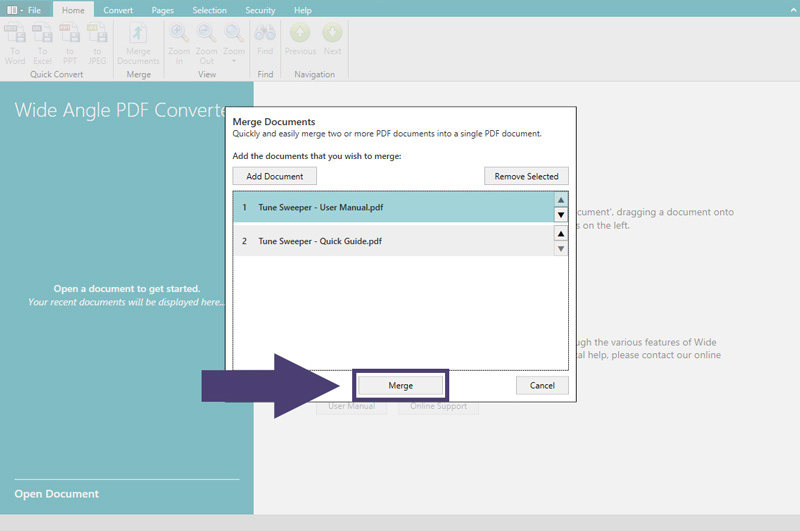 If you already have a PDF document open in PDF Converter, you can easily merge a second (or multiple) file/s with it. With a document open, click the "Merge Documents" button from the Home tab in the toolbar. 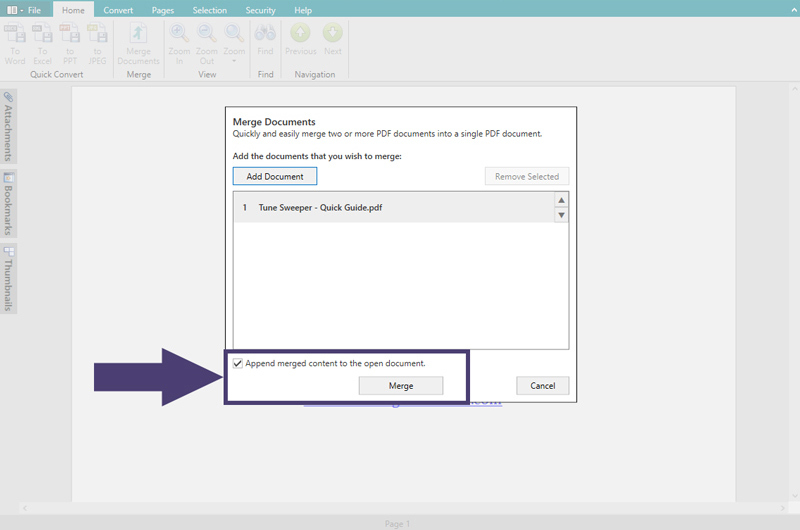 You can now add files to merge with your open document as seen in the "Merge PDF Documents" section above. The difference with this method, is that you now have the option to quickly append a single file with the document which is currently open. To do this, tick the "Append merged content to the open document" checkbox. Next, add a file that you'd like to add to the bottom of the open document, and click Merge. Note that you can only add one file using this method, as the file is added to the end of the open file.